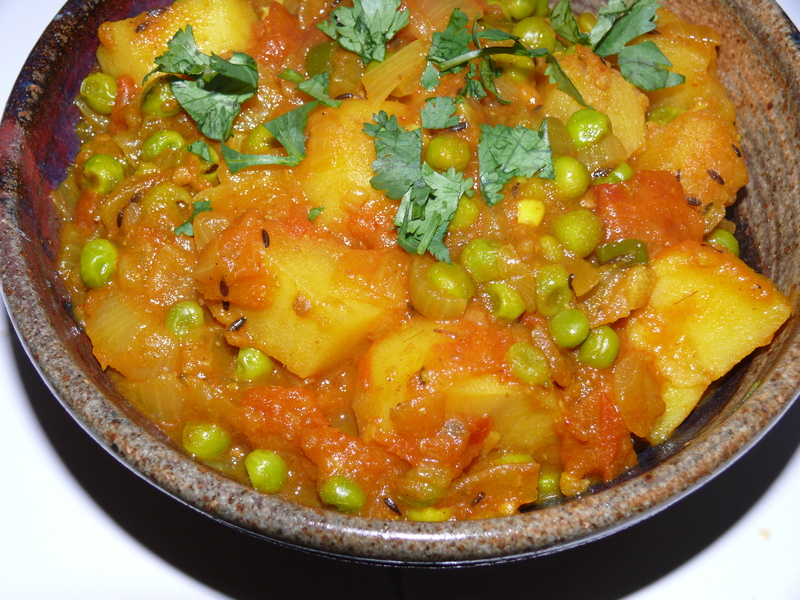 Aloo mutter is a Punjabi dish of potatoes and peas. A while back I posted another not so traditional version of aloo mutter which is much more saucy and tomatoey. Today I post a more traditional version that has a few tomatoes, but it is more dry and all about the potatoes and peas. I based my recipe on Honey What’s Cooking’s blog. Heat the olive oil in a medium sized pan over medium heat to medium high heat. Add cumin seeds and saute until they brown. Add the garlic, ginger and green chilis and cook for a few more minutes. Add the turmeric, chili powder, coriander powder, garam masala, and salt. Add the potatoes and a little water, cover and cook for 5-10 minutes, stirring occasionally. Add the peas and more water if necessary (I kept adding a little more water as the potatoes cooked). Top with cilantro and serve with roti, rice, yogurt and papad!